website of Saugor Cantonment Board is www.cbsaugor.org. The application forms are available in online portal is www.mponline.gov.in from 28-09-2018 onwards. The closing date for submitting the online application forms is 30 days from starting date. The educational qualification for applying Safaiwala Jobs is candidates should passed in 8th class. The candidates will be shortlisted based on their performance in written test and skill test. 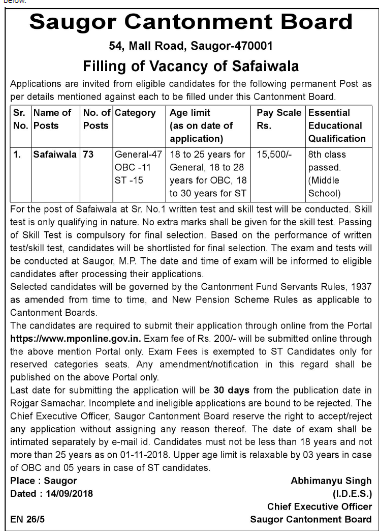 For more details of Safaiwala jobs in Saugor Cantonment Board Recruitment notification 2018 is given below. The age limit for the candidates belongs to General category is in between 18 – 25 years as on 1-11-2018. 3 years upper age limit relaxation will be applicable for the candidates belongs to OBC category. 5 years upper age limit relaxation will be applicable for the candidates belongs to ST category. The educational qualification for the candidates applying for Safaiwala jobs in Saugor Cantonment Board is should be passed in 8th class. The salary offered for the shortlisted candidates is Rs.15500/-. The application fee for the candidates apply for Safaiwala Jobs is Rs.200/-. There is no fee for the ST category candidates. Based on merit in written test and skill test candidates will be shortlisted for the final selection. Candidates can refer the official notification for exam pattern and syllabus. 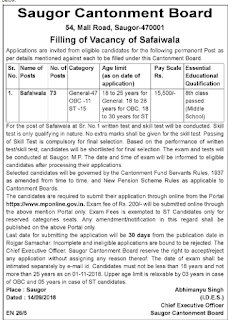 Interested candidates can apply for the Safaiwala jobs in Saugor Cantonment Board recruitment Notification 2018 through online portal is www.mponline.gov.in starting from 28-09-2018 onwards. The date for applying the online application forms is 30 days from starting date. The examination date will be intimated separately by e-mail id.